Height & Weight: 6’3” 210 lbs. 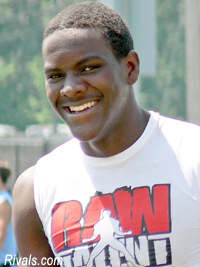 Clark earned All-City and All-District honors and racked up 70 tackles, 19 sacks and 22 tackles for loss in 2010. Frank picked Michigan over Michigan State and North Carolina. Sean O’Connell, UMGoBlog.com: "Clark is a very good, but raw athlete. He has a good jump off of the line of scrimmage and decent speed. Michigan is recruiting him as an outside linebacker, but he could possibly bulk up and play a rush type defensive end. He has a ton of talent, but it may take a little time to shine through"
Previous Previous post: What Happened to the Football Recruiting Class of 1998?